Tmt. E. Sundaravalli I.A.S., District Collector and District Magistrate, Tiruvallur is an IAS Officer belonging to the 2007 batch. She has done Post Graduation in Mathematics with B.Ed. She has vast experience in the field of Revenue Administration and has served as District Revenue Officer of Vellore District before being posted as the District Collector, Chennai in the year 2013. She has won accolades from senior bureaucrats and general public alike for her tireless work in distributing relief amount and materials as announced by the Hon’ble Chief Minister to the worst affected public during the unprecedented flood virtually inundating Chennai city in the year 2015. 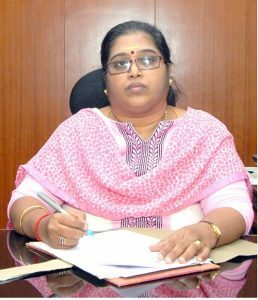 On assuming charge as District Collecotor, Tiruvallur in January 2016, she has taken various measures for the upliftment of the poor and the downtrodden public in the District which remains her very passion ever since joining the Government Service.